Matt LeBlanc test drives the new Aston Martin V8 Vantage, while Rory Reid puts the Rolls-Royce Phantom through its paces. With guest Stephen Mangan. Storm Hector causes havoc on the tracks, Sajid completes his last shift before he retires after 45 years in the station, and Beyonce and Jay Z are in town. Travelogue series with Tony Robinson. As he rides the rails across the mighty island of Australia, Tony visits a vast outback farm where herding is done by helicopter. He learns about the uncertain future facing the world-famous Great Barrier Reef and tries his hand at spearfishing. 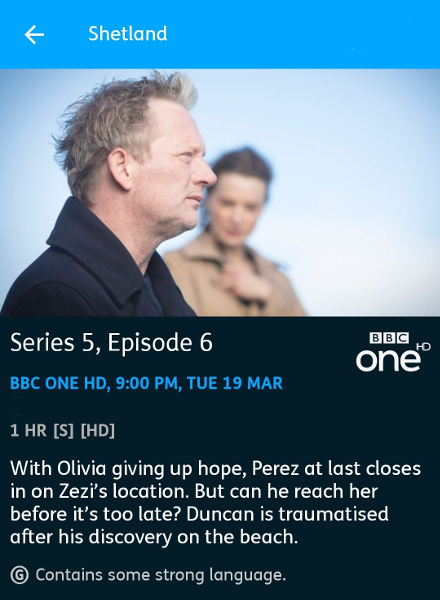 Perez closes in on Zezi’s location and tries to reach her before it is too late. Duncan is traumatised following his discovery on the beach. History series telling the glorious and gory story of the city’s rise to power. Dr Suzannah Lipscomb investigates how London’s West End became the playground of the wealthy elite, while Dan Jones follows in the footsteps of London’s poor in the east of the city. Rob Bell explores the impact of the greatest invention of the Victorian age, the railways. Winston is getting married but he does not have the means to give his bride her dream wedding, so the friends band together to give the couple the perfect day.